View the video "The Keokuk Union Depot - Its Role in Midwest Industry and Culture." during the Nauvoo (Illinois) History Project event. 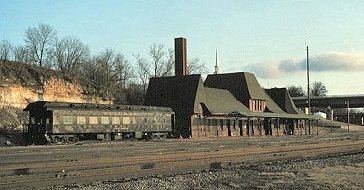 Listen to these interviews with people who remember the Depot when it was in railroad service! The Depot in March 2011, shortly after transfer to the City. At right is interchange trackage between Pioneer Railcorp and BNSF Railway. The Keokuk Union Depot, erected in 1891, was designed by the Chicago architectural firm Burnham and Root, noted for its railroad depot designs across the Midwest. Five railroads served Keokuk, a bustling business and transportation center at the confluence of the Mississippi and Des Moines Rivers and site of a series of locks that allowed river traffic to bypass the rapids upriver from the city. The new depot, combining passenger and express traffic of all railroads, was constructed and operated by the Keokuk Union Depot Company, jointly owned by the railroads. Read a newspaper article from 1890 describing Keokuk's proposed Union Depot. The Depot is distinguished by its Romanesque Revival features and is noted in the architectural preservation community as one of the last designs of John Root. It is listed in the National Register of Historic Places. The 178-feet building was constructed at a cost of $75,000. Read a newspaper article from 1891 describing the opening of the Union Depot. The central section, which originally contained offices on the second floor above the baggage room, was topped by the 64-foot-high peaked tower visible in the postcard illustration above and photos below. The vaulted waiting room is at the northeast end, while the southwest end originally served express agencies and contained the steam heating plant. 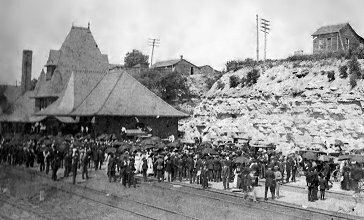 The Depot was illuminated at first by both carbide gas lamps and around 175 incandescent bulbs. 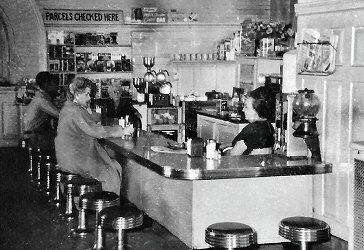 The waiting room included a lunch counter for the convenience of travelers and other frequenters of the Depot. Older illustrations show a clock in the central tower, but it was never installed. 1900, possibly to welcome a famous personage to the city. A fire caused by lightning on July 8, 1937 damaged the tower. A 1949 photo (above) shows it still in place along with the original clay tile roof. The tower was leveled off (losing 24 feet of height) and the tiles were replaced by shingles shortly after that time. Some interior walls were modified with changing needs through the years, as express and mail operations were altered. Nevertheless, the Depot retains its classic lines and its platform umbrella ("train shed"), which protected entraining passengers. Read a newspaper article from 1937 describing the fire that damaged the Depot's central tower. Route"). Keokuk was an important stop for the Burlington Route's streamlined Mark Twain Zephyr, inaugurated in 1935 between St. Louis, Missouri and Burlington, Iowa, and later for the Zephyr Rocket, a joint service of the Burlington and Rock Island between St. Louis and Minneapolis. For further information, visit our Passenger Service page. Railfan trip in May 1963 with CB&Q steam locomotive 4960. After passenger service was discontinued the freight railroads serving Keokuk used the Depot as a headquarters for their agents and operators. The last train to carry passengers through Keokuk was probably a Burlington Route railfan excursion in May 1963, pulled by preserved 2-8-2 (Mikado type) No. 4960. Read a newspaper article from 1978 about the elimination of the telegraph line to the Depot. 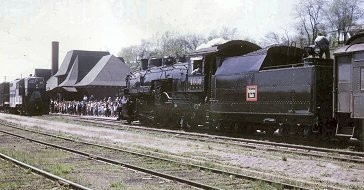 In 1981 the Keokuk Junction Railway purchased the shares of the Keokuk Union Depot Company, having previously acquired local yard trackage and switching rights from the bankrupt Rock Island. Beginning in December 1986 its operations extended over Atchison, Topeka & Santa Fe (former TP&W) trackage to La Harpe, Illinois, using the Mississippi River bridge owned by the City of Keokuk. 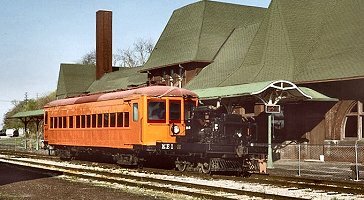 The Depot in 1992 with the private parlor car Chief Keokuck. The Keokuk Junction used the Depot as the base for its tourist train operations, some including the former Wabash parlor car renamed Chief Keokuck, and for its popular Trans-Mississippi trolley rides across the river to Illinois. In 1996 Pioneer Railcorp acquired the assets of the Keokuk Junction Railway, including the Union Depot, and used the building for storage. In 2011 Pioneer Railcorp conveyed the Depot and adjacent land to the City of Keokuk for a period of 99 years. The City formed a Depot Commission, members named by the Mayor, to oversee the management and preservation of the Depot. 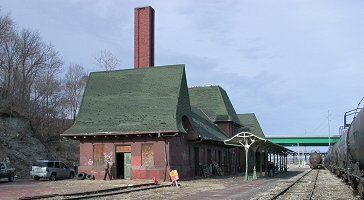 In 2012 the non-profit Keokuk Union Depot Foundation was established to raise the funds needed to restore the structure, with its directors not required to be Keokuk residents. Today, Keokuk is served by only two railroads: BNSF Railway and Keokuk Junction Railway (part of Pioneer Railcorp). How did five railroads get reduced to two? We'll take up the story, railroad by railroad. Both of these lines were absorbed into parent Chicago, Burlington & Quincy Railroad ("Burlington Route") in 1901, giving the CB&Q two-fifths ownership of the Keokuk Union Depot Company. In 1970 the CB&Q combined with Great Northern Railway; Northern Pacific Railway; and Spokane, Portland & Seattle Railway to form the Burlington Northern Railroad. In 1996, BN merged with the Atchison, Topeka & Santa Fe Railway ("Santa Fe") as the Burlington Northern and Santa Fe Railway, which was renamed BNSF Railway in 2005. The "Rock Island," once the "mighty fine line" of song and story, served few markets not served by other railroads. 1964 was its last profitable year. In 1980, crippled by strikes and poorly maintained physical plant, it ceased operations. Parts of it not taken over by other railroads were abandoned, including the branch from Eldon, Iowa to Keokuk. 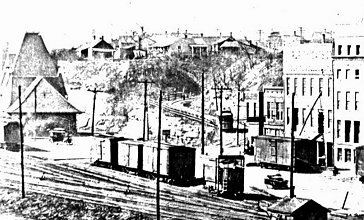 The Keokuk Junction Railway was formed to take over the Rock Island's industrial switching operations in Keokuk. independent of the Santa Fe, and is today part of the Genesee & Wyoming family of short line railroads, but it no longer operates to Keokuk. The Wabash served Keokuk with a line through Carthage, Illinois which connected with the TP&W at Elvaston, and ran into Keokuk on trackage rights over the TP&W. In 1964 the Wabash was taken over by the Norfolk & Western Railway. In 1978 the N&W abandoned the line to Elvaston and the trackage rights to Keokuk. In 1982 the N&W combined with the Southern Railway to form the Norfolk Southern Railway. The NS has a haulage agreement over BNSF through Keokuk to reach a disconnected line to Des Moines, but the trains are operated by BNSF and NS has never served Keokuk. The KJRY was established in 1980 to operate abandoned CRI&P trackage in Keokuk, switching the Hubinger Co. (Roquette America in 1991) and other industries. In 1981, KJRY took ownership of the Keokuk Union Depot Company. In 1986 the KJRY acquired former TP&W trackage between Keokuk and La Harpe (technically, only on the Illinois side because the railway bridge is owned by the City of Keokuk), and later operated by rights over other TP&W trackage. In 1996 the KJRY was sold to Pioneer Railcorp. In 2005 Pioneer Railcorp (KJRY) acquired the entire "West End" of the TP&W, reaching the Peoria area. Before 1880 the TP&W was called the Toledo, Peoria & Warsaw. The line between Hamilton and Warsaw was included in Santa Fe's 1986 sale to KJRY. Whether it subsequently saw any revenue service is uncertain; it has been severed at the Warsaw Road crossing, but most trackage is still in place and, apparently, it has never been officially abandoned. The Keokuk Union Depot Company is still legally owned by Pioneer Railcorp and is listed in its inventory of short lines, although it exists only on paper. View slides from a PowerPoint presentation on the history of railroads in Keokuk. 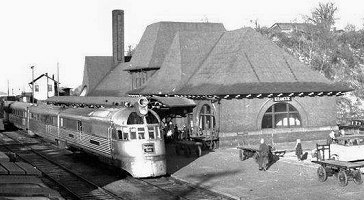 Do you have a memory of the Keokuk Union Depot, or an old photo? Email it to the Depot Commission.